The Stratton Flour Mill served the Ohio Valley for more than 85 years, producing the finest bread and pastry flours and one of the first self-rising pancake flours, for which the Mill became famous. Today, the Mill is being restored to its appearance in 1902, and to the power source introduced in 1937 -- a 50 horsepower Buckeye diesel engine. In that year -- 1877 -- Cornelius Vanderbilt would die on January 4 as would Crazy Horse on September 5; swimming would be introduced as an American sport; and Rutherford B. Hayes was the nineteenth president of the United States. A chronology and brief history of Stratton Flour Mill are available on this Website. 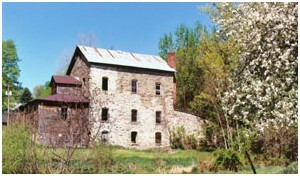 Captions: Rear of Stratton Mill. Note that the stone has been re-pointed on most of this side of the Mill. This photo is taken from the approximate location of the Mill's orginal stables, which were used for horses untill the Mill purchased its first truck. Then cows replaced the horses, and the stables bacame the first Stratton dairy barn.